Following Iron Man 3's big debut, two new openers will aim to keep the May momentum going: Baz Luhrmann's The Great Gatsby and Peeples. Also, you can now find our final domestic forecasts for the weekend's new releases below our analysis. - Leonardo DiCaprio and established director Baz Luhrmann bring the film a lot of potential mainstream interest. - The classic book and original Robert Redford film are well-known among older crowds. - A strong marketing campaign from Warner Bros. is helping to interest younger audiences (women, in particular). The use of modern music from artists like Jay-Z is also a factor. - Twitter and Facebook activity have been excellent this week. Flixster numbers are also strong. - Provides counter-programming for those who have already seen, or don't want to see, Iron Man 3. - Opening in the wake of Iron Man 3 will still prove challenging. The second weekend of May rarely produces breakout openings. - Early reviews are on the negative side of things. - Modern music and flair aside, Gatsby is a period film and those typically have a rough time finding big audiences. - Tyler Perry's "presents" credit will help the film cater to his fans. - Star Craig Robinson is well-known from his roles in "The Office", Hot Tub Time Machine, and various Judd Apatow flicks. Kerry Washington is also fresh off the success of Django Unchained. - Should appeal to urban crowds looking for a comedy. - The Perry fan base is limited and doesn't always turn out, especially without Perry's presence in the film itself. - Those looking for a comedy are likely to wait for The Hangover Part III in two weeks. - The film's Twitter activity is significantly behind Tyler Perry's Temptation. Facebook activity only slightly trails. 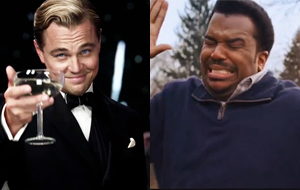 The BoxOffice team is forecasting a $115 million domestic total for The Great Gatsby and $28 million for Peeples. Check out our weekend forecast for these films and the remainder of the top 10 in the table below. The Great Gatsby (2013) May 10, 2013 Warner Bros.